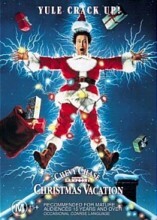 National Lampoons Christmas Vacation DVD from DVDLand. This holiday season Clark Griswold (Chevy Chase) vows his clan will enjoy "the most fun-filled old-fashioned family Christmas ever." Before you can sing "Fa-la-la-la-lah," he decks the halls with howls of folly in the perennial favorite National Lampoon's Christmas Vacation. Seeing is believing. There are 25,000 lights on the roof. An exploding Turkey on the dining room table. A SWAT team taking siege outside. A festive supporting cast (including Beverly D'Angelo, Randy Quaid, Julia Louis-Dreyfus, Juliette Lewis, William Hicket and more.) And a John Hughes script full of wit, heart and sheer goofiness, Yule love it! Click the button below to add the NATIONAL LAMPOONS CHRISTMAS VACATION to your wish list.